A variety of 1960s TV legends unite for 2017’s animated adventure Batman Vs. Two-Face. At Springfield Penitentiary, Batman (voiced by Adam West) and Robin (Burt Ward) witness Dr. Hugo Strange’s (Jim Ward) experiment to cure criminals of evil impulses. However, this goes awry and leaves District Attorney Harvey Dent (William Shatner) both mentally and physically scarred. Now a member of the criminally insane, Dent becomes a villain called “Two-Face” and does battle with the Caped Crusader and the Boy Wonder. 2016 brought Return of the Caped Crusaders, an animated effort that allowed alumni of the 1960s Batman TV series to come back to their roles. In addition to West and Ward, it also boasted Julie Newmar as Catwoman. All three return for Two-Face, and fellow 1960s Batman alum Lee Meriwether pops up this time, too. Since she also played Catwoman, she gets a different role, but it’s still fun to find her here. And Star Trek’s Shatner, too! He enjoyed no connection to the 1960s Batman, but he provides obvious star power. 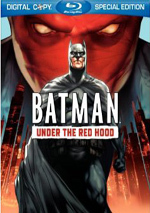 One assumes DC Animation would continue this series of direct-to-video efforts, but West’s passing seems to nip the burgeoning franchise in the bud. It’s possible he recorded work for a third animated tale before his June 2017 death, but if not, this should be it. I wish I could claim that West went out on top, but alas, Two-Face provides a fairly limp effort. I can’t say this surprises me, as I didn’t much like Caped Crusaders, but I’d hoped the second film would offer something better. Actually, Two-Face does top Caped Crusaders, as I think it’s a little tighter and not quite as campy/silly. Caped Crusaders offered a mushy mix of self-reference and winking nods that made it less a coherent movie and more an ironic collection of pokes at itself. Two-Face still comes with plenty of that kind of stuff, but I think those involved tone down the material – a little, at least. Or maybe the level of camp remains the same and my expectations led me to think Two-Face feels less goofy – either way, I didn’t roll my eyes as much this time. The presence of Shatner helps. He brings an arch sensibility that matches the movie’s universe well and his performance shows a pulse, something not always true for the others. Shatner gives us the most enjoyable aspect of the film. The others fare less well. Ward still musters a relatively boyish presence, but West and Newmar both sound old and tired. This shouldn’t come as a surprise, especially since both were well into their 80s when they recorded their parts, but it still becomes tough to swallow these youthful, vigorous characters with such wheezy voices. The story sputters much of the time. Though the battle with Two-Face becomes a main theme, the film throws in other characters and feels borderline random as it plods along. While it manages some entertainment along the way, the lack of coherence becomes a drag. I suspect that if you liked Caped Crusaders, you’ll probably enjoy Two-Face - and vice versa. Though I prefer it to its predecessor, it still leaves me disenchanted much of the time. 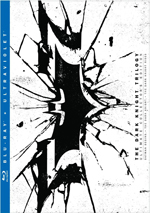 Batman vs. Two-Face appears in an aspect ratio of approximately 1.78:1 on this Blu-ray Disc. At all times, this became a strong presentation. Overall sharpness satisfied. If any softness occurred, I didn’t notice it, as this was a tight, concise image. No signs of jaggies or shimmering popped up, and I witnessed neither edge haloes nor source flaws. I thought the colors of Two-Face went with a fairly dark palette that favored blues. The hues remained full and rich. Blacks were deep and tight, while shadows seemed smooth and clear. This ended up as a pleasing presentation. When I examined the DTS-HD MA 5.1 soundtrack of Two-Face, it created a fine sense of action. The movie packed a lot of battles and involving material, and it used the five channels to impart that information in a lively manner. Explosions and fights filled the channels to create a full spectrum, and quieter elements fleshed out the room as well. As we shift to extras, The Wonderful World of Burt Ward goes for 14 minutes, 34 seconds and offers notes from actor Burt Ward. He discusses aspects of his life and career, with an emphasis on his Batman experiences. Some of Ward’s notes are interesting, but much of “World” acts as a commercial for Ward’s own brand of dog food – and it’s an advertisement with questionable claims about how this chow extends canine life spans. Maybe half of “World” works, and the rest drags. Next we find an Adam West Tribute Panel. It lasts 39 minutes, 27 seconds and features radio host Ralph Garman, filmmaker Kevin Smith, writer James Tucker, and actor Lee Meriwether; a few circa 2016 comments from West himself appear as well. They discuss memories of West and offer an appreciation of his life and work. As expected, this leans toward praise, but the participants maintain enough of a comedic bent to make it enjoyable. Three similar clips arrive after this. We find Burt Ward on Being Starstruck (2:03), Burt Ward on Ambition (0:59) and Julie Newmar on Inspiration (1:53). These quick tidbits provide their experiences related to Batman. The snippets offer minor insights but not much of substance. Two separate Sneak Peeks discuss parts one and two of Batman: The Dark Knight Returns. These fill a total of 19 minutes, 28 seconds and include comments from executive producer Bruce Timm, DC Entertainment Animation Creative Director Mike Carlin, casting director Andrea Romano, director Jay Oliva, screenwriter Bob Goodman, co-producer Alan Burnett, and actors Peter Weller, David Selby, Ariel Winter, Michael McKean, Michael Emerson and Mark Valley. We get notes about story and characters as well as cast and performances. These become basic advertisements and not much more. One Easter Egg shows up here: a 32-second animated clip. This gives us a quick snippet with Harley Quinn and Joker that seems to tease a subsequent film. To find it, simply click on the “star” to the right of “Trailers” in the bonus features menu. The disc opens with an ad for Justice League and Batman & Harley Quinn. Trailers adds promos for Teen Titans: The Judas Contract and Batman: Return of the Caped Crusaders. A second disc provides a DVD copy of Two-Face. It includes two sneak peeks as well as trailers but it loses the other extras. 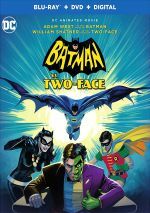 While it improves on its predecessor, Batman Vs. Two-Face still fails to coalesce into anything memorable. Too silly, campy and inconsistent, it mostly falls flat. The Blu-ray offers excellent visuals as well as very good audio and minor supplements. Fans of 1960s Batman might enjoy Two-Face but it doesn’t work for me.